This calculator will help you to answer the question, "How much will I save if I refinance my car?" 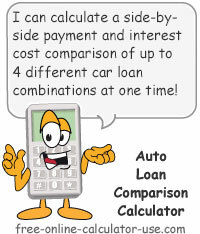 Specifically, the calculator will calculate the monthly payment and interest cost comparison between your current car loan and a new refinance loan. Plus, the calculator also gives you the option of increasing the size of the refinance balance to include an amount of cash you think you might need (not recommended). Furthermore, the calculator includes a field for including any refinancing costs that will be charged by the lender, along with a checkbox to indicate whether or not you want these fees rolled into the new loan balance (not recommended). And finally, the calculator will display a line-by-line comparison chart containing the principal, payment, rate, number of payments, and interest cost for both scenarios, followed by a summary, a bar graph, and buttons for creating a printer friendly report and a revised payment schedule. How much does it cost to refinance a car? How a smaller payment may actually end up costing you money. Calculate auto loan refinance savings and print out a report and revised payment schedule. Enter the original dollar amount of the car loan (principal amount), but without the dollar sign or any commas. Enter the term (number of monthly payments) of the original car loan. Enter the monthly payment amount for the original car loan, but without the dollar sign or any commas. Enter the number of monthly payments already made on your original car loan (enter a zero if no payments have been made). Enter the new annual percentage rate (APR) that will apply to car loan refinance, but without the percent sign. Enter the new number of monthly payments that will apply to the car loan refinancing. Enter the total of any refinancing fees charged by the lender. Tap the description to place a checkmark in the box if you would like the refinancing fees included in the refinance loan amount (not recommended). In either case the fees will be added to the refinancing interest cost. If you would like to borrow an amount over and above what you owe (not recommended! ), enter the amount here, without the dollar sign or any commas. Based on your entries, the first column in this row is the amount you still owe on the original amount borrowed. The second column in this row is the first column plus any fees rolled into the new loan, plus any additional cash you wish to borrow when you refinance. The third column shows how much higher or lower the refinance principal is than the current principal. Based on your entries, this row contains your current monthly payment and new refinance monthly payment. The third column shows how much higher or lower the refinance payment is than the current payment. Based on your entries, the first column in this row is the estimated annual interest rate of your original car loan. 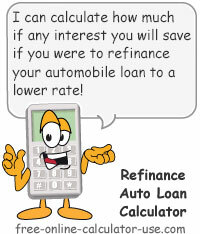 The second column shows the new refinance rate you entered in the top portion of the refinance auto loan calculator. The third column shows how much higher or lower the refinance rate is than the original rate. Based on your entries, this row shows the number of monthly payments for your current and refinanced car loan. The third column shows how much higher or lower the refinance number of payments is than the current remaining number. Based on your entries, the first column in this row shows how much interest you will pay if you leave your current car loan as is. The second column shows how much interest you will pay if you refinance (includes any entered refinance fees). The third column shows how much higher or lower the refinance interest and fees are than the current remaining costs. If the amount in the third column is preceded by a plus sign, you will actually lose money by refinancing your auto loan. Enter the original amount borrowed (principal). Enter the original number of monthly payments. Enter the original or current payment amount. Enter the number of payments you have already made. Enter the refinance annual interest rate. Enter the refinance term in number of months. Enter any refinancing fees you will be charged by the lender, and indicate whether or not you want to roll the fees into the new loan principal. If you need to borrow additional cash as part of the refinancing, enter the cash amount. Tap the "Calculate Auto Refinance" button. This will populate the refinance comparison chart and display a bar chart comparing the interest costs of the both scenarios. Whether you should refinance, how much it costs, how it works, and what to watch out for. If all of the following are true, you may qualify for, and stand to gain from, refinancing your car, truck, RV, or motorcycle. I am not behind on my loan payments. My current or a competing lender is offering a lower interest rate of at least 1%, and without forcing me to extend the current loan repayment term (extending the repayment term may more than offset the lower rate) or pay a fee just to apply. My car is fairly new, and I'm still in the first half of the total repayment term (it may be difficult to find lower rates for older cars, and greatly reduced balances won't offer as much in interest savings). Note that some financial advisors will tell you that another good reason for refinancing is to cash out the equity in your car for the purpose of paying off high interest debt. For example, if you still owe $10,000 on a vehicle valued at $15,000 (price it would sell for), you would have $5,000 worth of equity ($15,000 value less $10,000 loan balance). If you follow this type of advice, you could refinance your vehicle for $15,000, pay off your $10,000 auto loan, and have $5,000 in cash to pay off high interest credit card debt. My problem with that advice is that you are trading non-secured credit card debt for secured debt, which is not something I'm in favor of. If I wanted to cash out the equity in a vehicle to pay off high interest debt, I would sell the car for $15,000 and buy a $10,000 used car. That way I would I have $5,000 cash to pay off high interest debt, without trading unsecured debt for secured debt. Fees for refinancing a vehicle loan are usually minimal. When refinancing from reputable lenders, fees are normally limited to lien transfer and registration fees, which run between $10 and $100 combined. Unscrupulous lenders, on the other hand, may come up with a host of other fees to make up for a lower rate offer. Therefore it's important to weigh the total cost of the loan (interest plus fees) when comparing refinancing offers. If you're not sure what rates are available to you, you can visit Lending Tree's website to compare auto refinance rates based on your credit score. You might also check with your local credit union as they tend to offer low rates for auto loans. Refinancing an auto loan usually involves two or three simple steps. Call your lender and get the current payoff amount and interest rate of the loan. Ask your lender if you now qualify for a lower rate. If your lender says yes, and the fees are reasonable, ask to refinance your current loan with them. If your lender says no, shop around for other lenders who offer a lower rate. If you can't find a lower rate, there's little reason to refinance. If you do find a lower rate than what you're paying, and the total cost of refinancing will end up saving you money, fill out a loan application with that lender. If your loan is approved, your new loan is then used to pay off your old loan. Throughout my career of building online calculators I have continually encountered mortgage, student loan, and auto refinance calculators that use the term "monthly savings" when referring to a lower monthly payment. In my opinion this is false advertising, because in many instances the lower monthly payment will only serve to increase the cost of the existing loan. Well, if the smaller payment must be made for a longer period of time (higher number of payments), then the total of all lower payments can be more than the total of the smaller number of higher payments. The only way to tell whether or not refinancing will actually save you any money is to calculate the total interest cost from now through the end of the original loan, and then calculate and compare the interest cost from now to the end of a refinanced loan (including any applicable refinancing fees). If the total interest cost and fees for the refinanced car loan add up to less than the total interest cost for the existing loan, then yes, refinancing will save you money. Otherwise, if the total interest cost and fees after refinancing is greater than the total interest cost of the existing note, then no matter how low the payment is, refinancing is not saving you money ... it's costing you money. 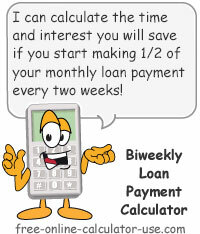 Please keep this in mind when using any refinance calculators that are not located on free-online-calculator-use.com. I will never use the word "savings" unless actual savings have been calculated to exist.